Megan is another friend of mine in our "Lostensday" group, like Stacey (in K-Town!). She has amazing style, both personal and decorative. 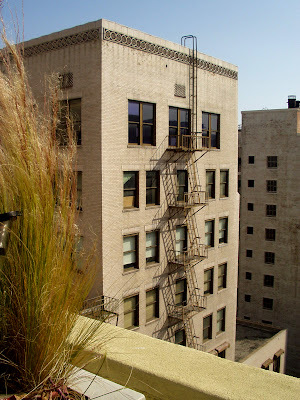 The first time I saw her apartment in downtown LA I was blown away: not only had she found a great place with cement floors, high ceilings, and the biggest windows ever, but she did a top-notch job in putting it together. (The first time I saw her apartment we'd also gone ice skating then drinking, and she called me a betch for not trying her homemade lemonade. In a totally hilarious way. Megan, you betch! I don't even remember if that was really lemonade!) I took so many pictures during my visit to her place for this post that I couldn't possibly fit them all -- check out the slideshow at the bottom of this post, or go here for the full gallery! 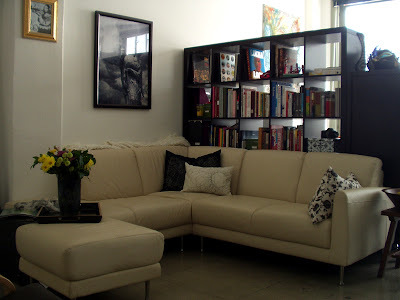 The sitting area, framed by the sectional and bookcase The loft itself is roughly L-shaped and has an open floor plan. 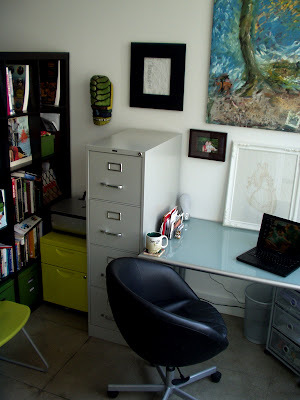 When you walk in you've got the living room with its cool white leather sectional and the kitchen area, then behind the ever-present and ever-beloved EXPEDIT bookcase is her office area and a small dining area, and beyond that is her bedroom, bathroom, and single, solitary closet. A sleek, stainless steel kitchen. The IKEA storage boxes above hold things like out-of-season clothes and camping gear. Limited cabinet space means more things have to be out on the countertop, so Megan picked her appliances to go with the black-and-steel scheme. 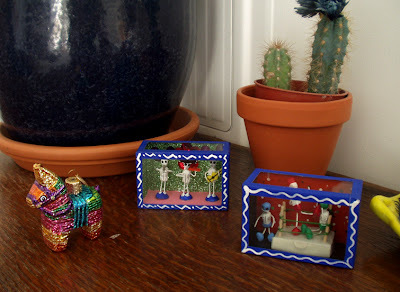 Megan is a grad student getting her PhD in Latin American Art History (with an emphasis on Mexico) at UCLA, and clearly being surrounded by original art is a priority for her. 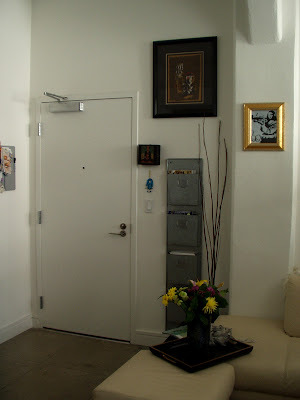 On her walls is an amazing collection of original paintings, photographs, and prints, and lil' sculptures and objets d'art are on just about every surface. The print was something Megan had seen in a gallery downtown, and was later gifted to her by a friend Megan does extensive work and studying in the Mexican city of Oaxaca, and that's where most of the pieces above come from. 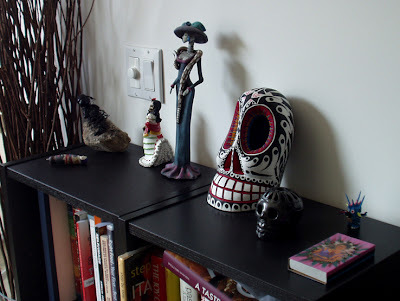 She told me that each of the villages in the area specializes in a certain kind of craft; the large painted skull is from a village that does woodworking, and the smaller black skull is from a village that makes an incredible-looking black clay. I don't think I had ever seen anything like it; it was really cool. Though she doesn't have much time for it now, Megan's a fantastic artist; she did the painting that hangs above her desk Because Megan's also a smarty-pants professor, she needs a distinct office area in which to work (or stare out the window). 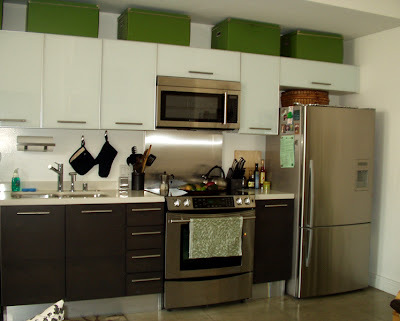 The EXPEDIT divides the space from her living room and kitchen, and multiple drawer units provide much-needed storage. 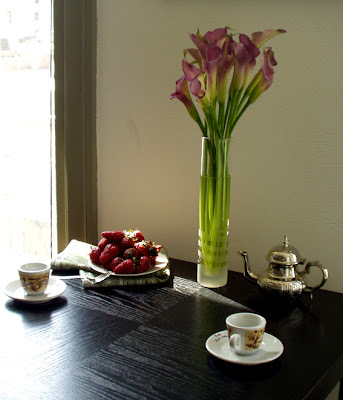 A high cocktail table and stools stand in for a traditional dining table, and good lord I need to eat breakfast because those strawberries are making me hungry. 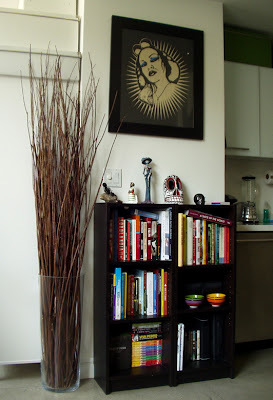 Megan's home staging skills are formidable, I must say. Okay, I had some cereal, I'm back. Where were we? Well, as I mentioned before, storage space is extremely scarce in Megan's place; she has one closet in her bedroom that has to hold everything one might have in a clothes closet, linen closet, and hall closet. Basically, her vacuum is right next to her shoes. 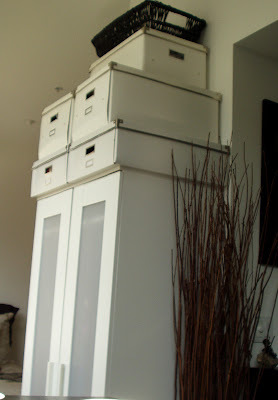 So, Megan has had to create storage, such as with this wardrobe and boxes. But what separates the women from the girls (so to speak) in terms of putting together a beautiful home is making even that storage beautiful. The white wardrobe with the white IKEA storage boxes looks clean and uniform, like it was planned to be that way all along. Who needs a closet anyway? Each piece of furniture in Megan's home has a history to it, just like her art collection. She likes having a story to go with each piece. The century-old dresser above belonged to her great-grandmother, and even still has the funky cool drawer lining her grandmother installed. (The painting above? Made by her grandmother!) Megan's color palette is largely neutral; after having brightly-painted walls in her old place, having big white walls was a refreshing change. 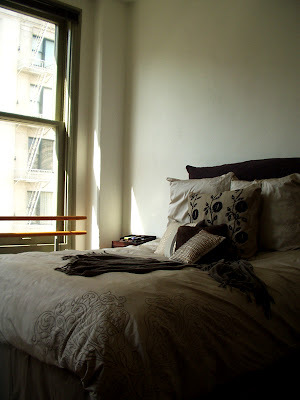 Her bedding is a mix of earth tones, and most of her furniture is unpainted wood or otherwise neutral. Still, it took me a while to even realize that because her accessories, like these folk crafts, are so bright and colorful (and glittery!). Gorgeous. Imagine waking up there every morning! 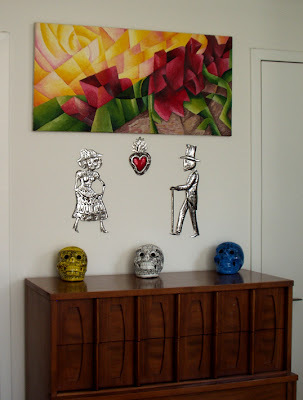 The painting was done by a friend of a friend, and the tin skeletons and clay skulls were picked up while traveling. 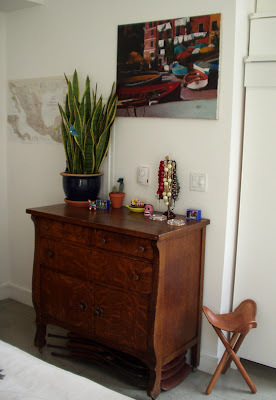 The dresser (and matching nightstands) are original mid-century, from her grandparents. 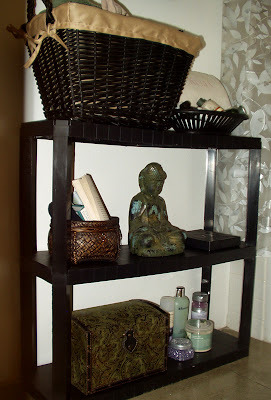 Megan's goal for her bathroom was for it to feel like a spa, and she damn well nailed it. I love how the table lamp looks on her counter, and her shelf unit with the Buddha, rolled towels, and bath goodies look like they're straight out of a fancy day spa. Megan loooves her baths. 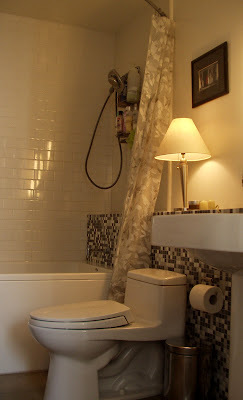 She even finds the time to take a bath in place of a shower before a typical work day. It's such a good idea. She starts her day off with something most people do at the end of the day (if they even do it at all!) to relax. When you're got a small home, having an outside space makes a big difference. Megan's rooftop is so awesome that you could practically live in a cardboard box in the building's basement and you'd still be cool with it. Jealous? Yep. The rooftop has a lounge area, a barbeque, a hot tub, and incredible views. 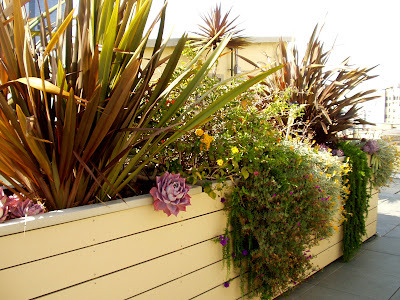 The walls are high enough, especially with the plants, that almost all wind is deflected, leaving the rooftop sunny and warm. Ah, Los Angeles. 72º and sunny 300 days out of the year. I love this apartment! 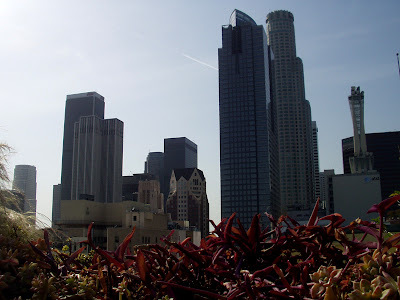 I getting a glimpse instead the apartments in DTLA because I always walk by the buildings and wonder what they look like. She used the space really well. Yeah! That Megan chick is soooooo cool and amazing! Wow! She is so chic! I want to BE her!!! Wow! Megan is totally fabulous. I bet she's either sunning herself on her rooftop or taking a bath RIGHT NOW. I love your place. Great use of space. 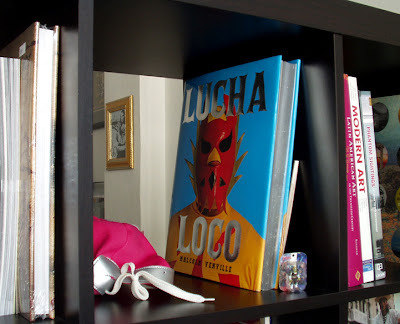 any info on the artist for the print over the mini bookshelf? love it! Dang! I fix, no worries pretty lady. I saw you changed it. So sweet and not really necessary. Thanks for profiling my pad. You make it look awesome! Megan, you live in a mini paradise and I am not a little jealous. Dang girl, you have an amazing sense of style. You must be so happy there! I especially love your great-grandmother's dresser and the choice to go with neutral colors so that your marvelous art pieces really stand out. Inspiring!